If you haven’t visited the vaults at John MacArthur’s ministry website Grace to You, you should head over and take a look around. The sermon resource section is massive, dating all the way back to 1969 — 40 years worth of preaching. 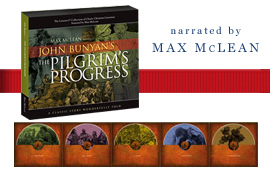 His sermons can be browsed by date, title, series, Scripture, topic and code number. Just like John Piper’s Desiring God site, the audio messages are also available as a print option. Al Mohler recently visited Harvard’s Divinity Hall and reflects on Ralph Waldo Emerson’s address to the graduating class of 1838 which amounted to a declaration of war on Biblical Christianity. Mohler asks the question, ‘Why do churches and denominations have a tragic record of keeping their institutions orthodox and evangelical?’ This is a sad pattern that crosses demoninational lines. The bottom line is that in the tide of secularization, these institutions do not keep their people accountable. This is very insightful commentary by a sage of our age. For those of you in need of ideas for Christmas, if you’re looking for something in the audio category, allow me to offer some handpicked suggestions, both in my favorite audio content and audio mp3 electronics. 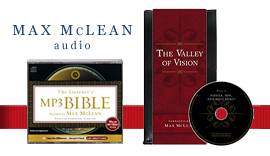 All products link to Amazon.com or Amazon.ca, and Faith By Hearing will receive an affiliate commission on every sale, no cost to you. 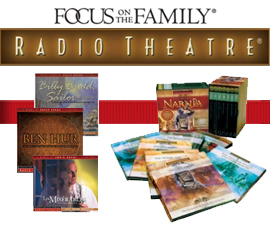 Focus on the family has done an amazing job of producing a number of audio dramas that my entire family loves. They are great for even the shortest of road trips. My kids are forever asking us to play the next disc when we get into the van. And finally, if you don’t yet own an iPod, there are a wide variety to choose from to suit your needs. 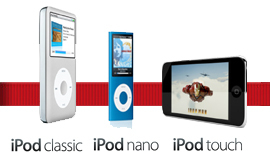 Although there are many other mp3 players on the market, I will always buy iPod. I have no complaints about my iPod, which is now 5 years old and still going strong in the coldest of weather as I commute to work everyday. It works easily with iTunes on Windows or Mac. I can’t recommend it more highly. Over the next few weeks, Ligonier’s website will be posting videos of all the sessions from the 2008 Together for the Gospel Conference. Broadcasts will end December 15.